"A popular Indian deep-fried treat, but without the guilt thanks to an air fryer. Don't forget the yogurt dipping sauce!" Mix red onion, yellow onion, salt, jalapeno, garlic, coriander, chili powder, turmeric, and cumin in a large bowl. Stir until evenly combined. Add chickpea flour and water. Stir to combine into a thick batter. Add more water if necessary. Let mixture rest for 10 minutes. Preheat air fryer to 350 degrees F (175 degrees C). Spray the air fryer basket with nonstick cooking spray. Spoon 2 tablespoons of batter into the basket and flatten. Repeat as many times as your basket allows without the bhajis touching. Cook in the preheated air fryer for 6 minutes. 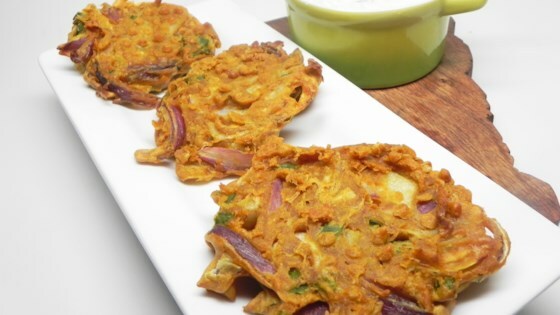 Mist the tops of each bhaji with cooking spray. Flip and cook 6 additional minutes. Transfer to a paper towel-lined plate. Repeat with remaining batter.